Recently, my grandma had to go to the hospital for some testing. In preparation for the test, the hospital emailed us a detailed list of all the food she had to avoid for 24 hours but maintain a high protein, low carbohydrate diet. My mom and I were trying to figure what that means and what to make for dinner that evening. You see, non-vegetarians can manage with boiled/steamed chicken or fish and vegetables. My grandmother is a pure vegetarian and has certain diet restrictions. After browsing through our pantry and refrigerator, we settled on soup. Everyone loves soup. 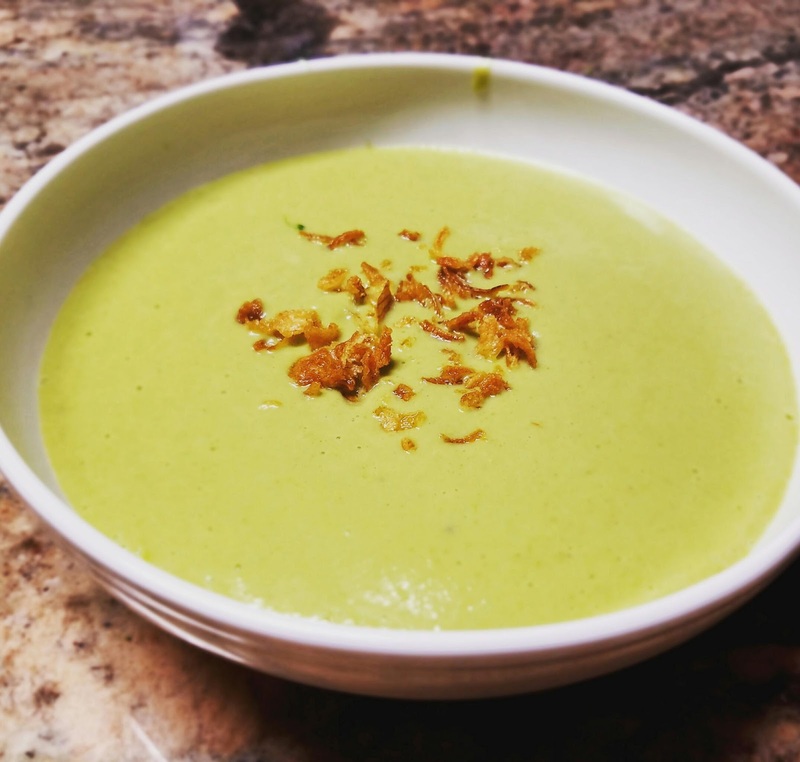 Below is our version of a "creamy" and silky Broccoli Parmesan soup that is both high in protein and low in fat. Cut the broccoli floret into 1/2 inch pieces including the stalk. Make sure to peel the stalk before cutting it into pieces and transfer the broccoli pieces into a microwaveable container. Next, add ginger-garlic paste, chili paste, milk powder, and drizzle with olive oil. Microwave with covered lid for three minutes. Transfer the steamed broccoli into a blender and add milk and 1/3 cup of water and blend it to a smooth consistency. Transfer the soup into a saucepan and add Parmesan cheese and bring it to a boil. If it is very thick, add additional water or milk. Serve the soup hot, garnishing with fried onions or croutons. We recommend using a high powered blender like the Vitamix blender or Magic Bullet for blending the ingredients together.